Have you ever been sitting back on your sofa, seeing no evil, thinking no evil, when suddenly, you hear a dripping sound? Alarmed, you investigate and discover water dripping from a single point in the ceiling. The drywall and carpeting are soaking wet. How can this be? Is there a hole in the roof? Not likely — the problem is much more likely due to ice damming. Typically, but not exclusively, ice damming occurs when temperatures are just below the freezing point. A warm attic melts snow and ice on the roof. The resulting water runs to the edges of the roof to the eaves trough. The water re-freezes, because this area of the roof is colder. An “ice dam” forms. Since there is now a wall of ice along the edge of the roof, when snow and ice in the middle section of the roof melts further, it cannot run off. Instead, it seeps underneath the shingles and finds its way into walls and ceilings. The damage can be extensive and extend over several stories of a home or building, depending on how long the situation goes unnoticed. When it comes to ice damming, the main culprit is a warm attic. What can be done about it? The heat transfer from the attic to the roof needs to be avoided. Make sure to have an adequate amount of insulation in-between the living and attic spaces. In addition, no installations should be set up allowing warm house air can push into the attic, for example, around pot lights and attic hatches. Furthermore, attic ventilation (in residential homes, usually soffit and roof vents) should always be unobstructed, allowing the cold outside air to flow through the attic space. Soffit vents can easily become obstructed when retrofitting an attic with additional insulation in a careless way. Another factor contributing to ice damming is the low-slope roof. This is because water flows more slowly on this type of roof giving it more time to re-freeze on the eaves trough. 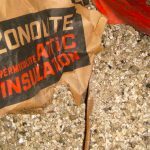 Another factor that adds to the problem is that insulation at the edge of the attic is difficult to install because of lack of space, so that part of the roof surface is more likely to heat up than the middle section. In modern construction, insulation material is evenly spread across the attic. In older homes, even when insulation is added during a retrofit, space is limited along the eaves and often insufficient. There are factors other than insulation that can cause ice damming. For example, the solar gain of some roof surfaces. Another factor could be specific weather events such as freeze-thaw-freeze cycles (especially here in Quebec!) An ice shield membrane of at least 6-8 ft width (depending on roof slope) underneath the shingles along the eaves can help. So what are we to do when we discover we have a leak due to ice damming? Fix the interior damage in a timely manner to avoid development of mold and stop water from continuing to seep in. While it can be pricey, it is recommended to have the ice dam removed by a professional. 24h-emergency services are offered by specialized companies in most locations. Since the main cause of ice damming is a warm attic, its insulation and ventilation condition should be improved. Warm weather is the best time to tackle this job. Roof shingles should always be applied in warm weather when they are soft, workable, and will properly stick to each other. It might be necessary to keep removing ice dams until the return of warm temperatures. Having survived the winter this way, it is advisable to install an ice shield membrane underneath the shingles in preparation for the next winter season.